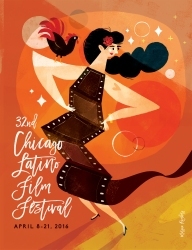 Chicago-based Visual Artist Morgan Ramberg was named this year’s Chicago Latino Film Festival Poster Contest winner and for Ramberg she thoroughly enjoyed the challenge of the creative process. Upon announcement, Lawndale Bilingual Newspaper spoke with Ramberg about her latest design. Lawndale Bilingual Newspaper: Congratulations on being named winner of the Chicago Latino Festival Poster Contest! Was this your first time participating? If so, what keeps you motivated to continue to participate? 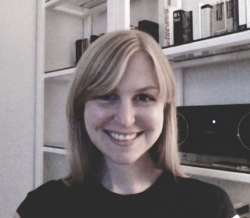 Morgan Ramberg: Thanks! This is my fourth year submitting. What motivates me to enter this contest year after year is the unique challenge this contest presents. The designer must create a graphic that communicates something specific, while being a unified image that can translate across mediums. Challenging myself to create something special for this event has made me a more thoughtful designer. What inspired the design of the poster? I decided I would create something inviting and impactful this time around. I’d also been thinking about the lack of representation of POC in mainstream media, and really wanted to create a piece that showcased a Latino actor, standing proud in the spotlight. What does it mean for you to have your design selected? It means a lot to have my design selected. I was born on the south side of Chicago, went to college on the north side, and am now living here as a working illustrator. I rarely get the opportunity to create work that will be viewed around the city, and I couldn’t be happier. I’m grateful that the Festival thought this poster was a good representation of their event. What do you enjoy most about the process of creating? The best part of making anything is brainstorming. When an idea is still a bit abstract, the possibility of the work being great seems endless. The fun ends in the execution, that’s all misery! Then, maybe, you’ll feel okay when once you’ve finished the piece. How would you encourage others to get involved in the contest next year? Make something that can work as a contained graphic that packs a lot of visual punch. It should look good big, it should look good small. Most of all – I would advise people to start thinking of concepts early! It took me years! The 32nd Chicago Latino Festival runs April 8th through 21st. For more information, visit www.chicagolatinofilmfestival.org.